Okay, it’s official: Mario Batali truly is a superhero. Just take a look at that Mario Batali Pizza Knife. Only the purest of heart and clearest of mind can wield such a weapon tool. It even has his personal superhero logo plastered on it, so there can be no doubt as to whom it belongs. The pizza knife measures fifteen and a half inches across, allowing for the slaying slicing of most pizzas in one fell swoop. 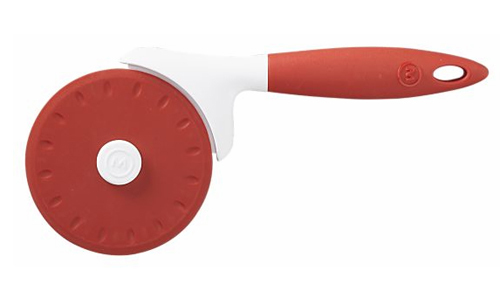 For the not-so-pure-of-heart, or for those still in training, there is always the Mario Batali Pizza Wheel. 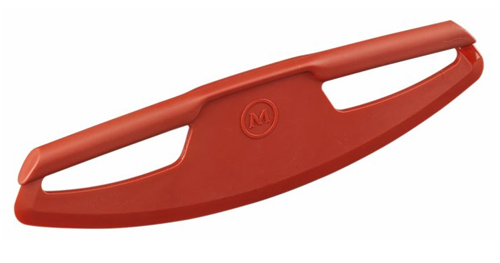 As a convenience for the home cook, the master chef has made sure there is a place for these in the home; Both the wheel and the knife feature nylon styling to protect your delicate non-stick pans. Mario Batali is a big man, both in stature and profession. As such, he would probably be difficult to get to visit your home kitchen to help prepare the family meal. 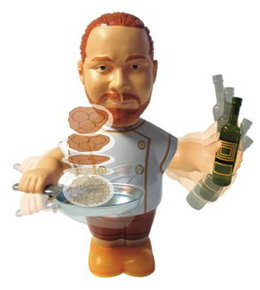 Luckily, a home version of Mario Batali is now available, in the form of a Food Flippin’ Mario Batali Tin Wind-up Toy. As the patron saint of your kitchen, this pint-sized Mario (5.25-inches tall), will stand guard over your pasta preparation. Handsomely crafted in tin, the wind-up toy lets loose by flipping its own pan of spaghetti and meatballs. Depending on how you interpret the expression on his face, he could either be passionately awaiting your completed meal, or admonishing you for mispronouncing spaghetti. (Which, of course, he should do.) 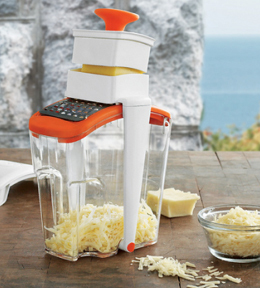 Either way, this Iron Chef could be yours for $9.95.